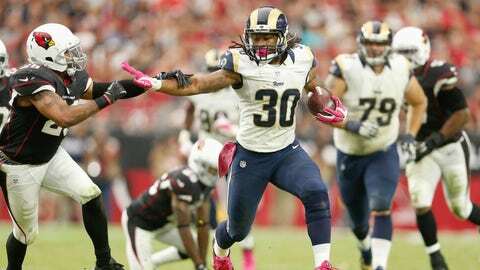 Todd Gurley's second-half workload on Sunday showed he was ready to be the lead running back. Todd Gurley is planning to practice this week without a brace on his surgically repaired knee. Just another sign that the rookie feels fully recovered from the knee injury that ended his season at Georgia last November? Perhaps, but St. Louis Rams coach Jeff Fisher said that moment for him came during the third quarter of Sunday's 24-22 win at Arizona. Playing in his second NFL game, Gurley knifed through the Cardinals for a 23-yard gain – his longest as a pro to that point – in the third quarter, but showed no inclination to head to the sideline. Instead, he toted the ball on the next three plays, setting up an 18-yard scoring pass to Stedman Bailey. Gurley proceeded to break off three more big runs and amassed 144 of his 146 yards in the second half, including 106 in the fourth quarter alone.